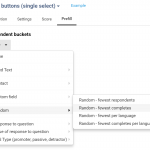 Page display logic allows you to show or hide pages for respondents depending on their previous answers or other meta-data such as custom fields, language, gender, channel, etc… . Now this page will only be shown to respondents whose gender is ’female’. All other respondents will skip this page and go to the next available page. 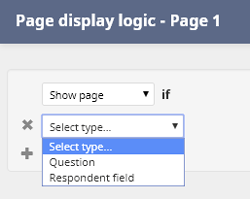 The advantage of using page display logic is that you can put it immediately on the first page of your survey, whereas with branching you always had to show at least 1 question to all respondents before dividing them into separate groups leading to separate pages. It will also minimize the number of branches needed. 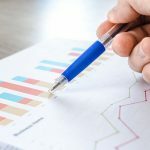 How do I add page display logic to my pages? Click on the blue button above the page you want to add page display logic to. 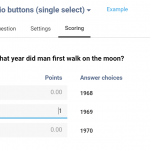 Set the condition using either a response to a previous question or a respondent field such as language, gender or custom field. You can add additional conditions if needed. The active page display logic will be shown in blue above each page. Page display logic combined with branching allows you to create complex routes through your surveys. Remember, though, that branching is applied before page display logic. So please test, test and test again.